Well, the title was reserved for a blog to be written when Tendulkar hit his hundredth ton... Seems that we will have to wait a little more for that. In the mean while, I reached this personal milestone of 100th entry in my Blog! Even though its not a historical or hyped event, but just a humble achievement of a rather unknown and uninspiring blogger, personally, it is a great achievement for me. What started as a time-pass has now become a passion. So, allow me to celebrate this small event. It is only proper that I express my gratitude to some important people who have helped me to reach this far.... I started out with no idea of what blogging is or how it is done. I was inspired by my friend Ranjith Menon to start a blog, way back in 2009 (I think). It was created and soon forgotten... Then for two years it lay dormant... I don't know what hit me, but in 2011 I started blogging like a man possessed ... and the result is that I am here at my 100th post today. Over the time, many fellow bloggers have helped me to go on... Deepak Karthik always made it a point to leave some comment for me. Indiblogger has given me friends like Saru Singhal, Magiceye (Deepak), Rohit Singh, Rahul Bhatia, Megha Sarin, Arti, Engram, Indu Chibber, Alka, Rajkumar, Sangeeta Reghu, Rakesh Kumar, Hariharan Valady, Deepa Gopal and Dee who have always supported me. Priya Nambudiri, and of late, GK Sir have also provided me with a lot of encouragement through their words. Leo Paw is another friend who have always been a motivator with his insightful comments... I feel a bit strange that I don't even know his real name...Thank you all!!! Ajoy Sir is an inspiring and exemplary figure for me ever since I've known him. Hence each opinion of his has been a value addition for me... My gratitude to him is boundless. Malini and Rajesh have been the greatest support back home, not only as elders, but also as fellow bloggers... A BIG Thank You! to you both.. Mohanan Moothringode is another person who has chipped in with his inspiring comments from time to time. Thank you Mohanetta! I still don't know the secret of earning 100s of followers. Nor have I understood how people could wave magic with their words to make hundreds of people tell them what they felt on reading the post. Me, I am happy that I could at least achieve what I have achieved till now...and looking forward to many more hours of happy blogging!!! Lastly, Thanks to Google Family (Blogger, Google, Google Images) and www.freedigitalphotos.net for providing me with the tools for making my blog more interesting!!! Thanks for the confidence and keep coming back often! Thank you GK Sir for your encouraging words!!! I am Honoured! Thank you very much Ashish!!! Glad to know that you've liked what you saw here... As I said in my blog, you also played a crucial part in taking the blog forward and I am greatful!!! Congratulations! There is a lot of dedication to your writing. You are a Master Juggler, for sure. I liked the way GK sir has put it. I don't think there is anything more to add to that. Thank you Maliniedathi!!! It means a lot for me... Cant thank you enough!!! Nisha, a big congrats! So, you beat Sachin to it! On a more serious note, one of the most appreciable things about your blog is the variety that you bring to it. Whether it is anecdotes, thoughts, poetry, photos or your sketches, it's the complete package. But the fact that you pull off those delightful pieces in all of 3 languages must make your blog absolutely unique! Wonder how many more are there out there which can be called multifaceted and multilingual. And all that can't happen with such consistency if you weren't so committed and consistent. A big thumbs up to that. Keep going...the thousand mark is beckoning :-) All the best!!! Thank You Rajeshetta!! Feels great when I hear such good things from you... Am honoured and humbled at the same time... Thank You!! Congratulations, Nisha for the accomplishment! A special thanks for mentioning my name in your blog:) Wishing you many more accolades in time to come... Keep blogging! Thank You! It was only befitting that I mentioned your name for the support you gave me..Thanks a lot! Congrats Nisha. Wish you many more 100s. 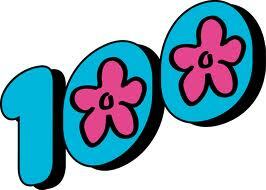 100 posts, wow...it is a commendable effort. Haha, looks like we hit our century together! :) Congratulations and happy for you. Hope you blog a lot more for many years to come. Thank you. You left me totally flabbergasted tagging me in your 100th post. You are a true versatile writer. Best of luck. Thank you Leo, for the good words and wishes! You totally deserve the 'tagging'. All the people I've tagged has helped me to stay focused and committed to Blogging... especially when I needed some encouragement... So, it was only fair on my part to acknowledge them! Thank you Rahul! I too hope so! A century is special indeed ! Rather late, I'm afraid, but still! Thanx for mentioning my name. That should motivate me to follow your blog even more avidly.